Product prices and availability are accurate as of 2019-04-16 16:04:15 UTC and are subject to change. Any price and availability information displayed on http://www.amazon.com/ at the time of purchase will apply to the purchase of this product. 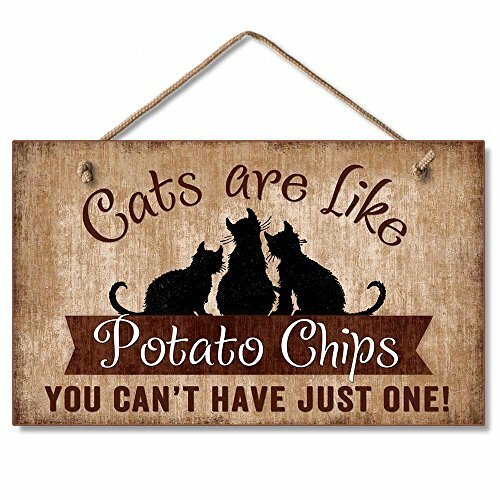 Cats are like potato chips, you can't have just one! This hilarious sign is a must-have for cat lovers. Sign features three cats on a weathered background. Makes a great gift for kitten owners! This wood plaque measures 9.5 by 5.75 inches and is easy to hang via the attached rope. USA Made. "Cats are like potato chips, you can't have just one!" Wood plaque features 3 cats on a weathered background Measures 9.5" x 5.75" Easy to hang with attached rope USA Made, Part of the Wooden Sign Collection Makes a great gift!